Harir Band consists of a group of young, vibrant and inspiring musicians who have been creating a unique sound, based on the traditional music of North Africa, full of sweet licks and creative melodies. The music paints a dreamy and colourful picture which transports the listener to a fantasy world where old and new, classical and modern, mix in a harmonious and magical new dimension. Harir Band have performed at many high-profile events, including Jerry Hall’s birthday party and the Chelsea Flower Show, as well as corporate and private functions and festivals. The band completed a very successful two week engagement during Ramadam in Dubai in September 2008. 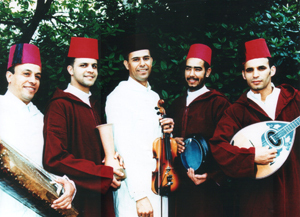 The band comprises mandole, keyboards, derbouka, Arabic violin, percussion and other traditional Arabic instruments, plus vocals. Harir Band can perform in various line ups from a 3 piece upwards.